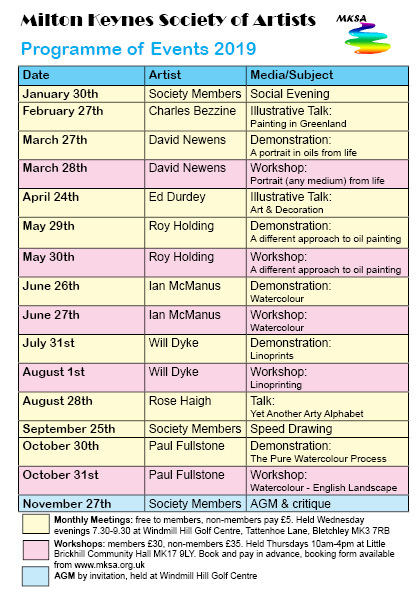 Our monthly meetings are held on the last Wednesday of the month, 7.30-9.30 pm. FOR DETAILS OF OUR JANUARY SOCIAL EVENING PLEASE SEE THE NEWS PAGE. THIS EVENT IS FREE TO NON MEMBERS, THERE ARE FREE REFRESHMENTS AND A FREE ENTRY IN OUR RAFFLE FOR A PRIZE BASKET OF GOODIES. Non-members of MKSA are welcome to attend, just pay £5 temporary membership at the door. If you join MKSA within a month of payment, the £5 will be deducted from your membership fee. See the Workshops Tab for Workshop details and 2019 booking form.